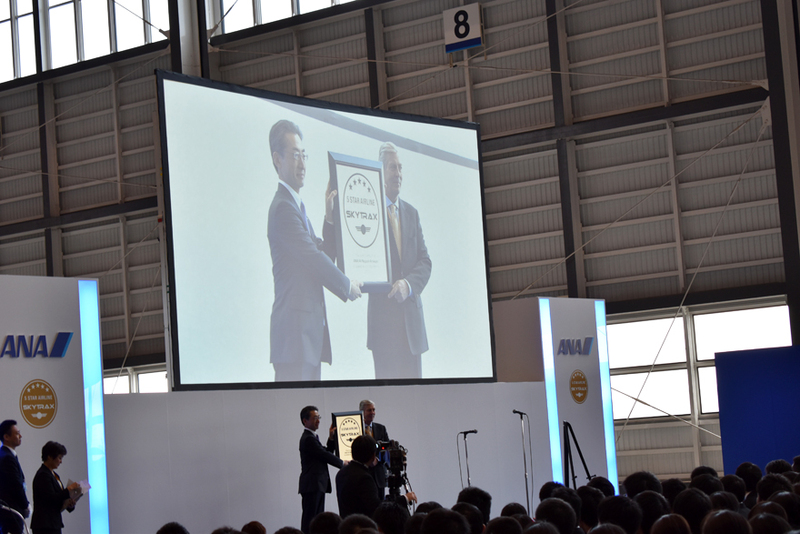 In a ceremony held at Tokyo Haneda Airport on 1st April 2017, ANA was awarded with the 5-Star Airline rating for the fifth consecutive year by SKYTRAX. 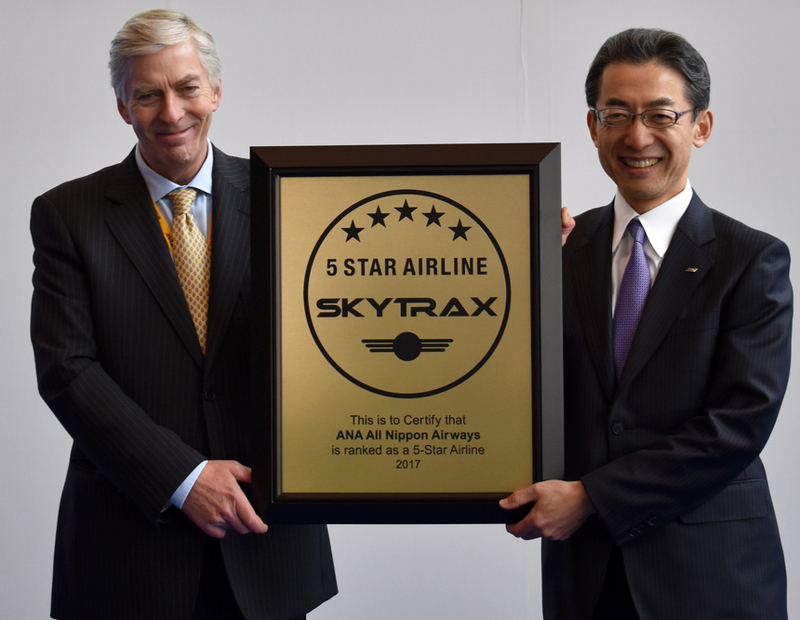 Only eight other airlines in the world have achieved this rating from SKYTRAX, the international air transport rating organisation, and ANA has the distinction as the only Japanese airline to earn this accolade. The 5-Star rating was awarded to ANA for the consistently high levels of service the airline provides to its customers, from check-in to arrival. It also recognizes that ANA strives to go the extra mile to continuously enhance its service quality as a global leading airline and meet the needs of its increasingly international customer base. The carrier continues to open new international routes, positioning its wide-reaching international network as a core growth strategy. ANA maintains its unwavering commitment to quality and Japanese hospitality with a personal touch, which helped the airline to maintain its 5-Star rating. In the past year alone, ANA has carried out a number of new initiatives to further boost its services. Renewed the check-in counter area of the South Wing Departure Lobby at Narita Airport Terminal 1 to accommodate smoother access to each airline, and installed new, convenient and speedy automatic check-in machines. At Tokyo Narita Airport ANA lounge, the carrier started a special ‘Chef Service’ where chefs prepare and directly serve customers nigiri-zushi (sushi prepared by hand) and other dishes. The service has earned exceptional reviews, particularly from international customers. Renovated the Departure Lobby at Haneda Airport Terminal 2. In addition to colour coding areas according to their functions, ANA installed an illustrated guide display that makes the lobby more efficient and easier to understand for customers requiring assistance, and for the growing number of tourists visiting Japan to easily connect to and from ANA’s domestic network. Deployed the ‘ANA Communication Board’, a specially-developed tablet device that can respond in 17 different languages, allowing greater support and clearer communication between ANA’s cabin crews and ground staff with international customers and those who require special care. Introduced Japan’s first ‘Remote Sign-Language Interpretation Service’ at Haneda Airport to improve services for customers with hearing and speaking disabilities. Launched Japan’s first ‘Universal Contents’ with subtitles and audio guides so that customers with hearing and/or visual disabilities can also enjoy the in-flight entertainment programs on international routes. ANA became the first airline in Japan to receive the Airbus A320neo aircraft, and is operating it on short-haul international services. Despite its size, ANA’s A320neo are equipped with features previously limited to mid- and large-airplanes, such as in-flight internet service and personal monitors installed in every seat, including economy class. 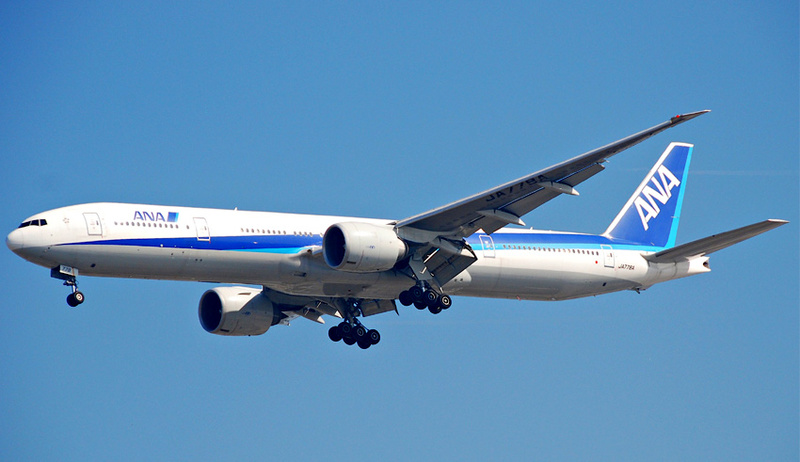 ANA is the largest airline in Japan by revenues and passenger numbers. Founded in 1952, ANA operates 87 international routes and 114 domestic routes. The ANA group has 35,000 employees and a fleet of about 260 aircraft. ANA has been a member of Star Alliance since 1999, and has joint-ventures with United Airlines on trans-Pacific and Asia routes, and with Lufthansa, Swiss International Airlines and Austrian Airlines on Japan-Europe routes. Its Frequent Flyer Program, ANA Mileage Club, has more than 26 million members. ANA is the launch customer and biggest operator of the Boeing 787 Dreamliner. World Airline Rating is the global airline quality ranking programme operated by Skytrax, the international air transport rating organisation and a leading authority on airline quality standards. Certified Airline Ratings classify airlines by the quality of front-line product and staff service they provide to customers, and are recognised as a global benchmark of airline standards. Established in 1989, Skytrax is based in London, United Kingdom. Using an internationally recognised evaluation system to assess quality, Skytrax provide the world airline industry with a professional, unified Quality classification system that is an established and respected symbol of airline standards. Certified Airline Rating is based on in-depth quality analysis of an airline’s customer-facing Product and Service standards, with a well-established approach providing accuracy, and an objective ranking system using global quality measurements. As part of the process to determine and award an Airline Star Rating, Skytrax carry out detailed Quality analysis across up to 800 different areas of airline product and service delivery for the on-board and home-base Airport environments. Certified Airline Ratings are not related to any type of customer reviews or passenger surveys.